"Orchard Park, New York" redirects here. For the village within the town, see Orchard Park (village), New York. 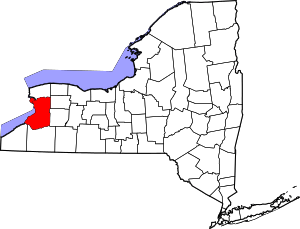 Orchard Park is a town in Erie County, New York, United States, and a suburb southeast of Buffalo. As of the 2010 census the population was 29,054. This represents an increase of 5.13% from the 2000 census figure. The town contains a village also named Orchard Park. Orchard Park is one of the "Southtowns" of Erie County. The town was separated from the town of Hamburg in 1850 and was first named "Ellicott", after Joseph Ellicott, an agent of the Holland Land Company. Within months, the name was changed to the town of "East Hamburgh". Around 1934, the town was renamed "Orchard Park" after its principal settlement. The Buffalo, Rochester and Pittsburgh Railroad Station and the Johnson-Jolls Complex are listed on the National Register of Historic Places. Orchard Park is located at 42°46′N 78°44′W﻿ / ﻿42.767°N 78.733°W﻿ / 42.767; -78.733 (42.7622, -78.7414). The village of Orchard Park is 14 miles (23 km) southeast of downtown Buffalo. According to the United States Census Bureau, the town has a total area of 38.52 square miles (99.76 km2), of which 38.44 square miles (99.56 km2) is land and 0.08 square miles (0.21 km2), or 0.21%, is water. U.S. Route 219 passes through the west part of the town and forms junctions with U.S. Route 20A (Quaker Street) and NY 179 (Milestrip Road). U.S. Route 20 (Southwestern Boulevard) passes through the north part of the town and forms a junction with NY 277 and NY 240 (Orchard Park Road). Chestnut Ridge Park – A popular county park with a wide range of activities, located in the south section of the town on Chestnut Ridge Road (Route 277). New Era Field – The home stadium of the NFL's Buffalo Bills lies on the western edge of the town. Bryant & Stratton College is located in Orchard Park. Orchard Park also has a number of private, Catholic schools, including Nativity and St. John Vianney. Our Lady of the Sacred Heart (pre-k through 8), closed in 2014 after exhaustive research conducted by the Diocese of Buffalo regarding demographics, finances and educational relevance. The annual Quaker Arts Festival, an outdoor art and craft show, is held each year on the third weekend of September, on the campus of Orchard Park Middle School. It was organized in the 1960s by Orchard Parkers John Coleman of The Suburban Press and Chet Seymour of the Orchard Park Presbyterian Church, and was originally held on the grounds of the Orchard Park Presbyterian Church. In its early days, the festival was cosponsored by the newspaper and the church. The festival is now cosponsored by the Orchard Park Jaycees and Bee Publications. The Orchard Park Chorale was founded in 1975 under the sponsorship of the Adult Education Program of the Orchard Park School District. Its more than fifty singers perform regularly at the Orchard Park Presbyterian Church. Orchard Park is home to Taffy's Hot Dog Stand at the corner of U.S. Route 20 and NY Rtes 240 & 277. Teds Hot Dogs is located about a 1/8 of a mile north. Duffs, Zebbs, Homegrown Bistro, Mangia and The Byrd House are other restaurants in town. The town is also home of the 3000th Tim Hortons restaurant location as well as Spot Coffee and Panera. Additional Orchard Park restaurants include Mighty Taco, a Buffalo-area chain restaurant, Charlie the Butcher, located adjacent to a Noco gas station, and the pizzerias Capelli's and Ricotta's, located within walking distance from each other on N. Buffalo Rd. National chains include and are not limited to Red Robin, Denny's, McDonalds and Wendy's. New Era Field, the home stadium of the NFL Buffalo Bills is located in Orchard Park. The 1993 and 1994 Orchard Park Little League Baseball team won the New York State Championship. They recently won five Section titles in three summers with one team winning three in the 10u, 11u, and 12u divisions. The Orchard Park Starz girls' travel softball program is made up exclusively by Orchard Park players and competes in the Metro Girls' Softball Association. 1 2 "Geographic Identifiers: 2010 Demographic Profile Data (G001): Orchard Park town, Erie County, New York". U.S. Census Bureau, American Factfinder. Retrieved March 2, 2016. ↑ " Thirteenth census of the United States, 1890, 1900, 1910" Department of Commerce and Labor. (1910), page 350. Retrieved 2013-02-16. ↑ "Land Use Study" (PDF). Town of Orchard Park. June 2002. p. 81. Retrieved February 16, 2013. ↑ Miner, Dan. "Reporter". Buffalo Business First. Buffalo Business First. Retrieved 18 March 2016.